The majority of Arab women dress conservatively. In the Arabic countries you will find a variety of traditions. Many women dress in clothes that do not cover their faces or hair, while others cover them and it all depend on the country they reside, their personal choice, or social level. A very conservative woman might wear a long black garment called "Abayah" that covers the body from the shoulders down to feet. Under this cover she could be wearing a traditional Arabian dress, "thawb", or she could be wearing the latest style designer clothes. 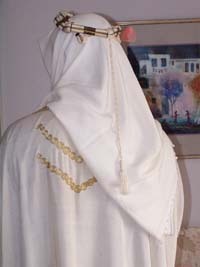 In addition to the Abayah, a very conservative woman would wear a face and head cover. Some women would wear the Abayah without the head and face cover, while others might wear a scarf-like cover called "Hejab" to cover the hair only and not the face. 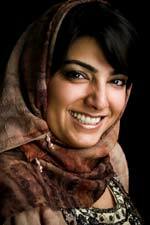 As well, many women wear the latest style clothes without an Abayah or Hejab depending on the country they reside in. In some countries, like Saudi Arabia, you never find women in the streets without the Abayah whereas in other countries such as Jordan, Iraq, Syria, Lebanon and Egypt you find a mixture of women either wearing the Hejab, Abayah, or casual jeans, shirts, long and short skirts. 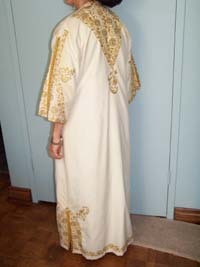 A thawb, thobe, or dishdasha is an ankle-length garment, usually with long sleeves, similar to a robe. It is typically worn by men in the Arabian Peninsula and some surrounding countries. It is normally made of cotton, but heavier materials such as sheep's wool can also be used, especially in colder climates. 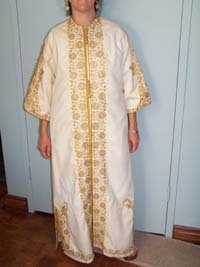 The style of the thawb/ thobe varies slightly among the various regions within the Gulf. 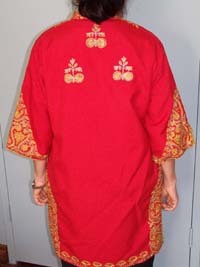 The sleeves and the collar can be stiffened to give a more formal appearance. The term thawb or thobe is also used to refer to a very long, oversized woman's garment with a heavily embroidered front panel. 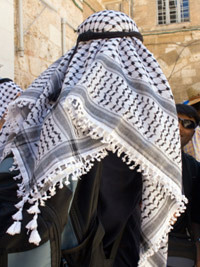 The kaffiyeh (also yashmag) is a traditional headdress of Arab men, made of a square of cloth (or scarf) usually cotton (also mix of cotton and wool for winter), folded and wrapped in various styles around the head. It is commonly found in arid climate areas to provide protection from direct sun exposure, as well as for occasional use in protecting the mouth and eyes from blown dust and sand. Local variations exist. Often, the kaffiyeh is held in place by a rope circle, called an igal. Sometimes a skullcap is worn underneath the kaffiyeh. The kaffiyeh is almost always of white cotton cloth, but many have a checkered pattern in red or black stitched into them. 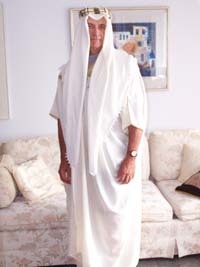 The plain, white kaffiyeh is most popular in the Gulf states, almost excluding any other style in Kuwait and Bahrain. 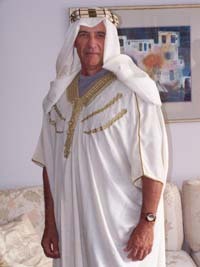 The black-and-white kaffiyeh is most popular in the Levant. The red-and-white kaffiyeh is worn throughout these regions, but is most strongly associated with Jordan. It has been used by Bedouins throughout the centuries and was used as a symbol of honour and tribal identification. The igal (also agal) is an accessory constructed of cord which is fastened around the Kaffiyeh to hold it in place. The igal is usually black in colour. An igal is usually constructed of black cord wrapped tightly around a core of goat wool or bunched fabric. 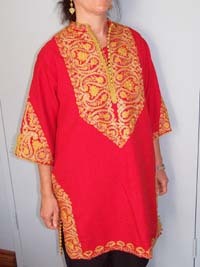 middle eastern embroidered ladies garment (thawb). 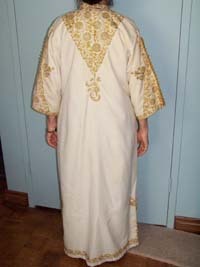 Front view of the traditional mens embroidered garment (thawb). 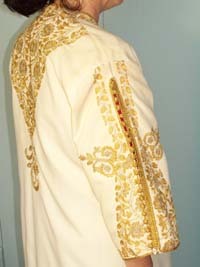 Back view of the traditional mens embroidered garment (thawb). 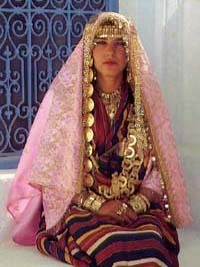 Tunisia djerba bride in Houmtsouk.